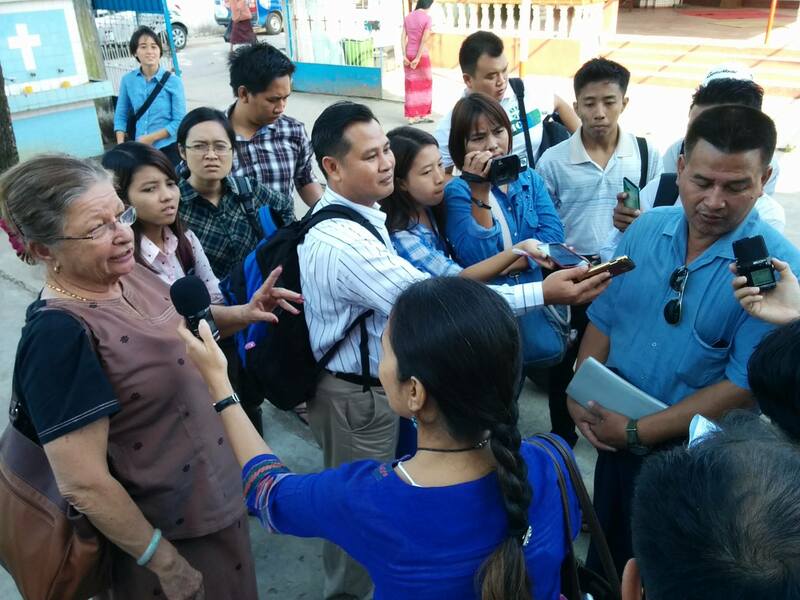 Our trainees form a media scrum outside St. Joseph's Catholic Church during a field trip to Hindu, Buddhist, Christian and Muslim houses of worship in Thingangyun Township, Yangon. 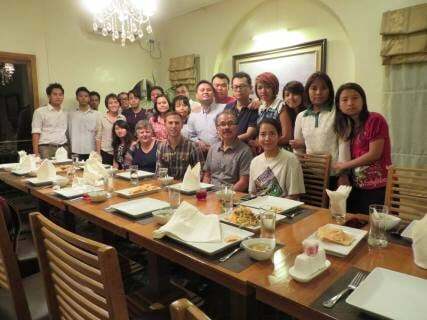 RNF assembled 15 journalists, editors and media professionals from across Myanmar for an intensive training course on how best to cover religious freedom and conflict. RNF assembled 15 journalists, editors and media professionals from across Myanmar for four days of intensive training on religious freedom and conflict reporting. Trainees Myat Noe from MNTV and Kay Zue from Mizzima Media interview a faith leader on the religious sites field trip. Classroom-based training sessions and guest speakers addressed Myanmar’s religious and ethnic diversity, hate speech, religious freedom, media freedom, conflict reporting and a range of other topics. The training also included a half-day field trip to interview local religious communities at their houses of worship and a public panel of faith leaders who discussed how they see local media portrayals of religion in the country. Our trainees form a media scrum outside St. Joseph’s Catholic Church during a field trip to Hindu, Buddhist, Christian and Muslim houses of worship in Thingangyun Township, Yangon. 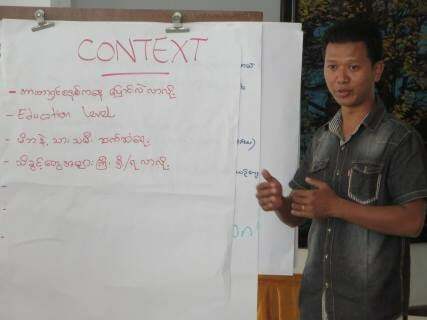 Over the four days, participating editors, reporters, bloggers and other media professionals representing print, radio, television and online outlets across Myanmar worked on stories demonstrating reporting practices learned during the trainings. The best of these stories were published in the participants’ own outlets, on Religionnews.com and by some of Religion News Service’s most prestigious international media subscribers. Kaung Myat Min, a reporter for Irrawaddy in Pyay, Myanmar, and one of our trainees, discusses how he will add necessary context to his story on clergy voting rights. A full video of the public panel with English subtitles is available here. Below you can read the Religion News Resolution on Covering Religious Freedom and Conflict in Myanmar, which our journalists drafted on the final day of training, and view photos from the week. “Reflecting on Faith in Myanmar Media” panel. 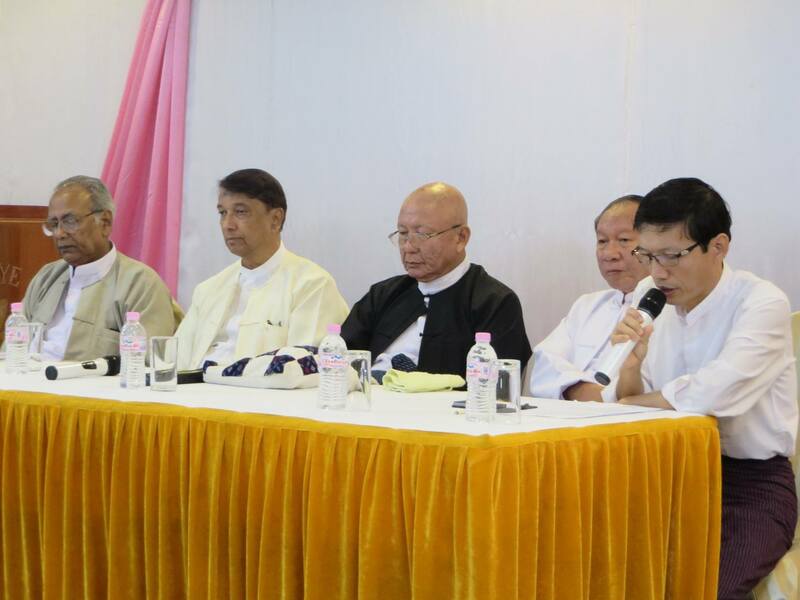 From left, U Aung Naing, Hindu community andExecutive committee member at Religions for Peace; U Aye Lwin, Chief Convener at the Islamic Centre of Myanmar and Founding Member, of Religions for Peace; U Myint Swe, President of Ratana Metta Organization and Chairman of Religions for Peace; Dr Saw Hlaing Bwa, Christian leader and Professor at the Myanmar Institute of Theology; and moderator U Myint Kyaw, Secretary General of the Myanmar Journalist Network. This event was made possible with support from the British Foreign & Commonwealth Office’s Human Rights and Democracy Programme. Develop our knowledge of different faiths. Avoid mentioning religious affiliation when it is not relevant to a story. Carefully consider word choice when referring to followers of different faiths. Not let our personal beliefs influence the objectivity of our reporting. Pass stories on to colleagues if our beliefs make it impossible to report fairly. Not let our faiths limit the religions we cover. Always consider the motivations of our sources. Be especially diligent in verifying all details when covering sensitive news. Strive to include moderate voices in our reporting, not just the extremes. Avoid hate speech or inflammatory words at all times, especially when reporting on religion, race, discrimination or conflict. Seek out knowledgeable sources capable of providing objective information and analysis. Encourage religious diversity in our newsrooms. Practice the qualities of responsible, ethical journalism by minimizing harm and avoiding hearsay and rumor. 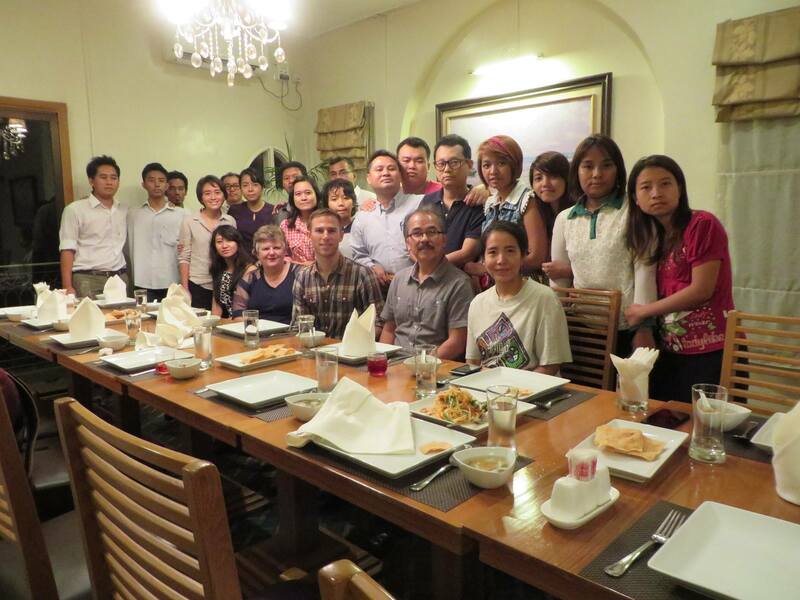 Farewell dinner at Le Nacha Restaurant in Yangon.